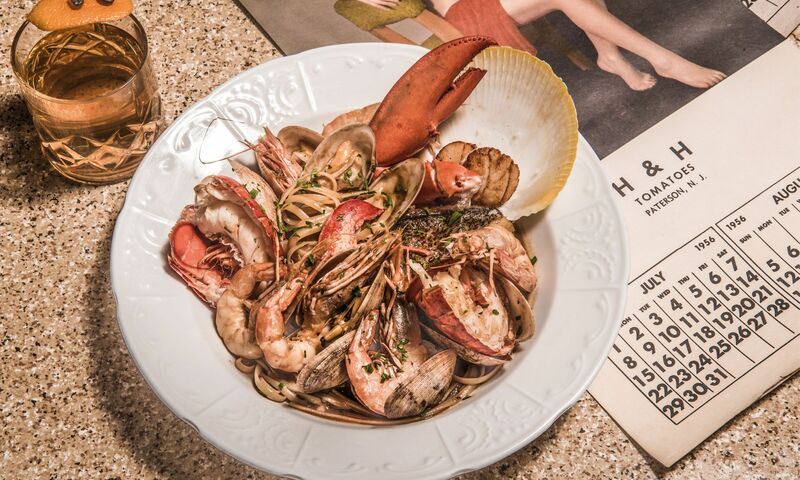 When Posto Pubblico and Linguini Fini first opened in Central, the farm-to-table concept took Hong Kong by storm. Over the years, as Linguini Fini moved spaces, and the group expanded with the opening of Stone Nullah Tavern (which will soon be rebranded into Fini’s), the team behind the fleet of saucy American restaurants is back on the scene to update its presence with Frank’s, a two-storey bar and restaurant on Wyndham Street. Sitting at the top of Pottinger Street, facing opposite to Tai Kwun, Frank’s welcomes guests with a vintage cocktail bar setting where the dimly-lit space comes alive with an abundance of dark wood counters, high chairs and a Motown classics soundtrack played throughout the evening. A swirling staircase reveals the upstairs dining room, a handsome space adopting the same homely ambience, accented with chestnut brown furnishings and Neapolitan table lamps scattered throughout the room. The best seats in the house are the banquettes overlooking the lengthy stretch of the space, which includes a view into the kitchen action at the end of the room. If there is one thing about the team behind Posto Pubblico and Frank’s that we can count on, it will be that they’ll nail it when it comes to red sauce American fare, polished and perfected over the years. This expertise is showcased in Frank’s one-page menu, featuring a humble selection of antipasti, pasta, meaty mains and vegetable side dishes. We began our night with the homemade burrata and Sicilian red prawns, the priciest antipasti on the menu at HK$298. The uncooked prawns were cut into thick chunks, scattered across and surrounding a bulging globe of burrata cheese, whose exterior resembled a soft-boiled egg and, when cut, revealed an oozing puddle of thick cream. Having been made in-house, the cheese was creamy and served at just the right temperature. There was no need for additional seasoning, thanks to the accompaniment of the umami-rich red prawns. The serving size for pasta can be rather generous. Spaghetti and meatballs came highly recommended, but we opted for pappardelle alla vodka instead, with its coral-hue of tomato vodka sauce richly dressing the broad pasta ribbons, dotted with crisp pancetta and rock shrimps. The star, however, was the handful of chopped shiitake mushrooms folded into the sauce, lending an earthy touch to the dish. Ricotta gnudi is well-executed, simply dressed with brown butter and a parmesan cheese sauce and crispy sage leaves. These dumplings were deceptively filling, so we strongly suggest sharing this dish among a larger party. The chicken Parmigiana supreme was set for sharing as a main, served in a much-similar fashion as the outstanding veal Parmigiana at Carbone. A half-chicken was deboned, keeping the bony bits of a wing tip, while the rest was pounded, breaded and fried until golden brown, topped with homemade tomato sauce and mozzarella cheese. The Italian-American staple was perfectly executed at Frank’s, where breast of chicken remained juicy while the skin stayed crisp throughout. The tangy tomato sauce and generous blanket of cheese add texture to the unctuous main dish. Desserts were introduced by the service team at the end of the meal. The sweets selections are very much red-sauce American classics—but don’t come expecting the likes of cheesecake, apple pie, and carrot cake. Frank’s selection includes zeppole (Italian fried doughnuts), pignoli (Italian pinenut cookie), a fruit-flavoured ‘poke cake’, and the cannoli. The latter two arrived shortly. Great cannoli are crisp pastry tubes, deep-fried until deep golden and filled with sweetened ricotta cream filling. Frank’s version has both ends dipped in melted chocolate and chopped pistachios, a nice touch that went well with the candied orange peel in the filling, which turned out tooth-achingly sweet although smoothly packed the fragile pastry. The ‘poke cake’ resembled that of an angel’s food cake, only fruitier and an acquired taste. The fruitiness in the cake came from raspberry jello, the manufactured powdered jelly dessert which is traditionally added into the butter-egg mix in place of sugar to create a sweet cake dessert. The same raspberry jelly topped the cake with a whipped cream topping. While the classic dessert was form-fitting to a T, it was indeed very sugary. The wine list at Frank’s features a great range of affordable bottles, including a wide selection of wines by the glass, as well as local craft beers from Young Master. The small handful of cocktails were made well, particularly the signature Frank’s Negroni, where a tumbler glass with a giant ice cube was filled with a great blend of Plymouth gin, Mancino Rosso vermouth and Campari. The simple garnish of an orange twist adds a zesty aroma to the drink, already a best-selling favourite at the establishment. Service plays a large role in Frank’s homely appeal, as the service team is well-versed in the establishment’s concept, especially when they share insight on food and wine pairing suggestions and portion control for smaller parties. The team was attentive and keen to offer suggestions where needed. A visit to Frank’s reminded us of Carbone, located just a few minutes away, with a more laidback and casual ambience accompanied by a great playlist of vinyl soundtrack of jazz, soul, and blues. The menu offerings are of good value with great execution. It is reassuring to see such comeback from the Red Sauce Hospitality Group (formerly the IHM) stable—this repertoire is gleaned from hard work over all these years, and Frank’s proves that they have mastered the formula.